The UFC 225 open workouts took place tonight at the Chicago Theatre in downtown Chicago, IL. Former UFC Bantamweight Champion Holly Holm took the stage and put on a show for the crowd. Along with the kicks and punches, Holly brought a few young fans on stage for a dance contest and some punching practice. 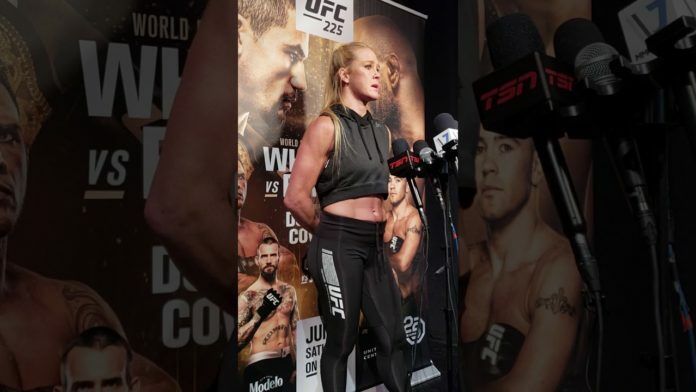 In the scrum Holly talked about what she knew about her opponent Megan Anderson, how she is consistently trying to learn everything in the sport, her preference for weigh-ins, and if she would be interested in potentially coaching The Ultimate Fighter opposite former foe and current Featherweight Champion Chris Cyborg.